Introduction: The aim of this in vitro study was to assess the sealing ability of ActiV GP/glass ionomer sealer and to compare it with sealing ability of Resilon/Real Seal and gutta-percha/AH Plus. Materials and Methods: Forty-five human mandibular premolars were randomly divided into three groups (15 canals each). Each canal was instrumented to a size 40, taper 6% using K3 NiTi rotary instruments. A smear layer was removed, and the teeth were filled using single cone technique with ActiV GP, Resilon/Real Seal, or lateral condensation with gutta-percha/AH Plus. The teeth then were immersed in 2% methylene blue solution for 24 h, longitudinally sectioned and examined under a stereomicroscope to evaluate the liner leakage of the dye in each group. The data were analyzed with descriptive statistical methods and Mann–Whitney test (P = 0.05). Results: The lowest mean of leakage was recorded in gutta-percha/AH Plus group. There was a statistically significant difference between gutta-percha/AH Plus group and the two other groups; ActiV GP group and Resilon group. Conclusion: Dye penetration examination showed that ActiV GP/GI sealer had weak sealing properties, Resilon/RealSeal system did not show superior sealing properties in comparison with gutta-percha/AH Plus sealer, and lateral condensation shows better sealing properties in comparison with single cone technique. The principal objectives of endodontic therapy are to clean and shape the root canal system and to fill the canal system completely in three dimensions. This aimed to prevent penetration of bacteria and their products into the periapical tissues and develop a hermetic seal. Inadequate obturation of root canal system results in failure of endodontic therapy. 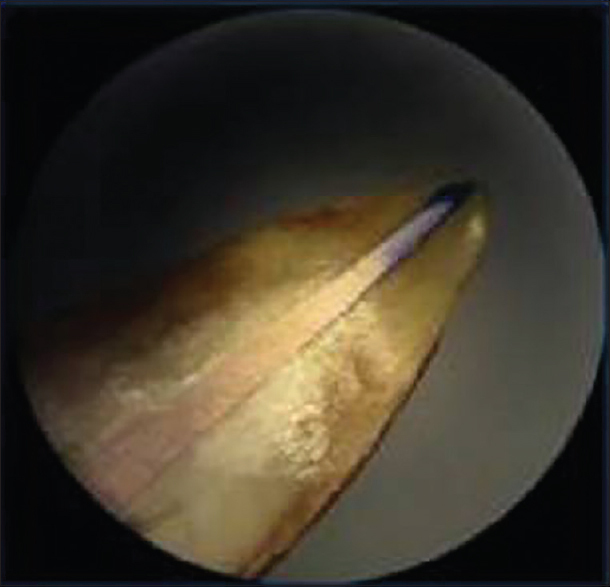 It has been shown that about 60% of endodontic failures are due to incomplete obturation of the canal space. In recent years, there has been an increasing concern about the poor sealing properties of the conventional root-filling materials, gutta-percha, and the different sealers. 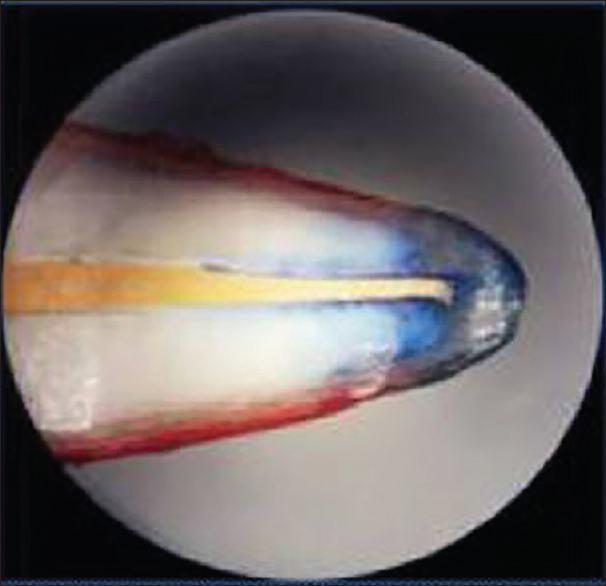 One of the recent trends in endodontics has been the development of obturating materials that are capable of bonding to canal wall dentin to eliminate interfacial gaps coronally and apically., Dentin adhesive technology has been adapted from restorative dentistry and applied to obturating materials through hybrid layer formation. Likewise, glass ionomer cements (GICs) which chemically bond to dentin through ion exchange and formation of an intermediate layer along the dentin-material interface have been adopted to produce GI-based root canal sealers. With the beginning of the 21st century, the artificer of root canal obturation materials fabricated, through adhesive mechanisms, a continuum of bonded interfaces from dentin to sealer to the core obturation material, and from the coronal to apical third of the canal realm, including all the irregularities of canal as fins, cul-de-sacs, and isthmuses. This hypothetical concept results in creating a monoblock in the root canal which, if successful, should completely eliminate interfacial gaps, produce perfect coronal and apical seal, and prevent reinfection of canal space after the treatment. The resin-based obturation systems RealSeal and Resilon have been introduced as alternatives to conventional obturation materials, gutta-percha, and the different types of sealer. It has been claimed that Resilon was the first obturation system has the ability to form a “monoblock” between obturation material and the canal walls. Resilon is a polycaprolactone polymer which contains radiopaque fillers and bioactive glass. The resin sealer adheres to a Resilon core on one side and attaches to the etched root dentine surface on the other side. ActiV GP obturation system is a new GI-based obturation system. The manufacturer claims the product to be better than previous products in terms of working time, radiopacity, and handling properties. ActiV GP consists of gutta-percha cones impregnated on the external surface with GI. These cones are available in 0.04 and 0.06 taper cones; the sizes of cones are precisely defined by laser to affirm a more accurate fit. These cones are used as single cone with a GI sealer to give a bond between the dentinal wall of the canal and the master cone. The aim of this in vitro study was to assess the sealing ability of ActiV GP/GI sealer and to compare it with sealing ability of Resilon/RealSeal and gutta-percha/AH Plus as a control group. Group 3: The canals were sealed using lateral condensation technique with gutta-percha points and AH Plus as sealer. A standardized size 40 GP master point (ALPHA-DENT, North Hamlin Avenue, Lincolnwood, USA) was selected and introduced into the root canal to full working length and was checked for tugback criteria. AH Plus sealer (Dentsply De Trey GmbH, Konstanz, Germany) was mixed according to the manufacturer's directions and applied to the canal wall using K-file size #25 in a counterclockwise rotation. The master point was then coated with a sealer and introduced slowly into the root canal until the working length was reached. Lateral condensation was performed using standardized finger spreaders (Mani Inc., Tochigi-Ken, Japan) and GP point sizes of # 15, #20, #25, and # 30. Once the obturation was completed, the gutta-perch cones were seared off 2 mm beneath the canal orifice. 2. Medium infiltration (dye penetration > 3 mm). This work has been conducted in full accordance with the World Medical Association Declaration of Helsinki, with an approval from the ethics committee in the university. The data were analyzed with descriptive statistical methods using Kruskal–Wallis and Mann–Whitney tests (P = 0.05) using SPSS software (SPSS version 13.0, SPSS, Chicago, IL, USA). The level of significance was set at 0.05. All groups in this study demonstrated dye leakage. The lowest mean of leakage was recorded in Group 3 (Gutta-percha/AH Plus = 0.37 mm) and the highest mean recorded in Group 1 (ActiV GP = 4.82 mm). Microleakage was significantly greater in Activ GP group(G1) than Resilon group (G2) and GP/AH Plus group (G3) (P < 0.05). The mean of leakage in Resilon group (G2) was 2.67 mm, and there was statistically significant difference between this group and the GP/AH Plus group (G3) (P < 0.05). The scores for apical dye penetration evaluation by Escobar et al. 's criteria are shown in [Table 1]. The extent of dye penetration in millimeters, the means, and the standard deviations for each group are listed in [Table 2]. 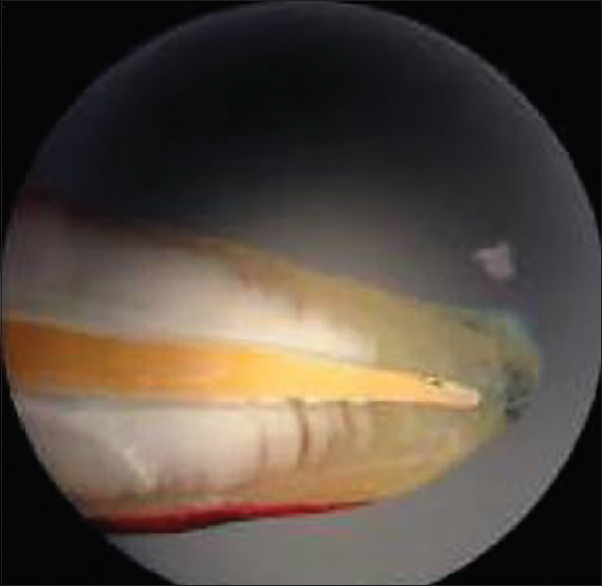 Recently, several obturation materials have been introduced into the endodontic field. Some of these are modifications of materials developed for restorative dentistry. Others may be considered as new once, with new concepts that have not been used before in endodontics. It is recognized that gutta-percha does not provide the idealistic bonding to root canal dentin, so several studies are conducted to find alternative materials for creating a apical seal that is tight and sustaining the root structure mechanically., GIC-based sealers can adhere strongly to dentinal walls, but they cannot bind to gutta-percha points, so a gap exists between the sealer and gutta-percha after complete setting through which fluids and bacteria can pass. ActiV GP is a root canal obturation system comprises gutta-percha cones coated with GI that can bond to radicular dentine surface and GI sealer. Sealing ability of ActiV GP/GI system has been evaluated in many studies; in this study, the highest mean of dye leakage was recorded in ActiV GP = 4.82 mm group, and there was statistically significant difference between the ActiV GP group and another groups (the Resilon group and the GP/AH Plus group). On the other hand, the finding of our study contradicted with that of Fransen et al. and Monticelli et al. ; these both studies found that there was no difference in leakage between teeth obturated with ActiV GP/GI sealer and GP/AH Plus. Grag in his study found significantly lesser leakage in the ActiV GP system group when compared with gutta-percha/AH Plus group and Resilon/Epiphany group after the interval of 7 day. However, there was no statistically significant difference in the leakage among all the three tested materials: gutta-percha/AH Plus, ActiV GP system, and Resilon/Epiphany at the end of the 4th week. A highly significant difference was shown between GP/AH Plus group and ActiV GP group. This result may be attributed to shrinkage on setting of ActiV GP/GI sealer, and the nonhomogeneous mix of GI sealer which is questionable and might have an adversarial effect on its properties. The ActiV GP/GI sealer system uses a single-cone technique in which a master cone is closely resemble the geometry of NiTi rotary instruments, thus, there may be a thick layer of sealer at interfacial area between dentine surface and filling material. It has been demonstrated that a thicker layer of sealer negatively influences sealing ability; larger thick layer of sealer can result in voids due to shrinkage upon setting reaction. In restorative dentistry, adhesive systems have shown reliable results as long-term execution and less technique sensitivity. In endodontics, the argument about the fulfillment of adhesive systems inside the root canal remains because of the limitations of bonding to radicular dentine. It has been shown that several factors negatively affect the adhesion of resin-based obturation materials. The anatomy of the root canal is more irregular with lateral canals and a decreasing number of dentinal tubules in the apical area. furthermore, the apical canal wall is partially covered with calcified appositions. The root canal system has an unfavorable geometry for resin bonding since configuration factor or C-Facto might be 100:1; virtually, every dentin wall has an opposing wall and there are minimal unbonded surfaces. Another limitation of dentin bonding is deterioration of the resin bond with time due to functional forces or incompleteness of resin infiltration into the demineralized dentin which leads to fluid movement between the hybrid layer and unaffected dentin. In addition to drawbacks during polymerization reaction of resin due to resin cure type (dual-cured or self-cured) or irrigating solutions and medicaments used during root canal therapy which interfere with the polymerization reaction of resin such as sodium hypochlorite, hydrogen peroxide, and eugenol. Concerns have been expressed that residual calcium hydroxide paste could prevent effective bonding in some areas that it can act as a physical barrier and that the high pH may act to neutralize the acid primer in self-etching adhesives. Epoxy-resin based sealers are used for many decades for their adhesive ability; AH26 is an epoxy resin-based material with good sealing ability, The long setting time and flowability of this material inhibits formation of cracks and fast detachment from the dentinal wall. It is a compatible material and can harden in the presence of moisture; AH26 has <0.5% constriction when entering the accessory canals. AH Plus is claimed to have the advantages of AH26, but it appears to be more radiopaque and have less microleakage compared to AH26. Moreover, AH Plus does not release formaldehyde and has a shorter setting time. Till this day, no root canal filling material can accomplish all the requirements for a perfect root canal sealing. The authors acknowledge the staff of faculty of dentistry, University of Damascus, Damascus, Syria and the staff of Al-Farabi College for Dentistry and Nursing, Riyadh, Saudi Arabia. Punia SK, Nadig P, Punia V. An in vitro assessment of apical micro leakage in root canals obturated with gutta flow, resilon, thermafil and lateral condensation: A stereomicroscopic study. J Conserv Dent 2011;14:173-7. Bakhtiar H, Heidari N, Mehrvarzfar P, Ghazvini K, Habibi M, Jafarzadeh H, et al. In vitro comparative study of the microbial leakage of one-step, thermafil and lateral condensation techniques. J Contemp Dent Pract 2012;13:27-30. Saatchi M, Barekatain B, Behzadian M. Comparing the apical microleakage of lateral condensation and chloroform dip techniques with a new obturation method. Dent Res J (Isfahan) 2011;8:22-7. Clinton K, Van Himel T. Comparison of a warm gutta-percha obturation technique and lateral condensation. J Endod 2001;27:692-5. Deitch AK, Liewehr FR, West LA, Patton WR. A comparison of fill density obtained by supplementing cold lateral condensation with ultrasonic condensation. J Endod 2002;28:665-7. Ingle JI. A new paradigm for filling and sealing root canals. Compend Contin Educ Dent 1995;16:306, 308, 310. Kim YK, Grandini S, Ames JM, Gu LS, Kim SK, Pashley DH, et al. Critical review on methacrylate resin-based root canal sealers. J Endod 2010;36:383-99. Mohammadi Z, Shalavi S. Clinical applications of glass ionomers in endodontics: A review. Int Dent J 2012;62:244-50. Teixeira FB, Teixeira EC, Thompson J, Leinfelder KF, Trope M. Dentinal bonding reaches the root canal system. J Esthet Restor Dent 2004;16:348-54. Johnson W, Kulild JC, Tay F. Obturation of the cleaned and shaped root canal system. In: Cohen S, Burns RC. Pathways of the pulp, 11th ed., Chapter 7. St. Louis, Missouri, Elsevier Inc. 2016. p. 299. Shipper G, Ørstavik D, Teixeira FB, Trope M. An evaluation of microbial leakage in roots filled with a thermoplastic synthetic polymer-based root canal filling material (Resilon). J Endod 2004;30:342-7. Fransen JN, He J, Glickman GN, Rios A, Shulman JD, Honeyman A, et al. Comparative assessment of ActiV GP/Glass ionomer sealer, Resilon/Epiphany, and Gutta-Percha/AH plus obturation: A bacterial leakage study. J Endod 2008;34:725-7. Escobar C, Michanowicz AE, Czonstkowsky M, Miklos FL. A comparative study between injectable low-temperature (70 degrees C) gutta-percha and silver amalgam as a retroseal. Oral Surg Oral Med Oral Pathol 1986;61:504-7. Li GH, Niu LN, Zhang W, Olsen M, De-Deus G, Eid AA, et al. Ability of new obturation materials to improve the seal of the root canal system: A review. Acta Biomater 2014;10:1050-63. Whitworth J. Methods of filling root canals: Principles and practice. Endo Top 2005;12:2-24. Doumani M, Abdulrab S, Samran A, Doumani A, Layous K, Özcan M. Influence of different obturation systems on the fracture resistance of endodontically treated roots. Braz Dent Sci 2017;20:6-11. Koch K, Brave D. A new endodontic obturation technique. Dent Today 2006;25:102, 104-7. Monticelli F, Sword J, Martin RL, Schuster GS, Weller RN, Ferrari M, et al. Sealing properties of two contemporary single-cone obturation systems. Int Endod J 2007;40:374-85. Garg TG. Comparative evaluation of sealing ability of various single-cone systems: An in vitro study. Int J Prev Clin Dent Res 2016;3:192-6. De-Deus G, Coutinho-Filho T, Reis C, Murad C, Paciornik S. Polymicrobial leakage of four root canal sealers at two different thicknesses. J Endod 2006;32:998-1001. Georgopoulou MK, Wu MK, Nikolaou A, Wesselink PR. Effect of thickness on the sealing ability of some root canal sealers. Oral Surg Oral Med Oral Pathol Oral Radiol Endod 1995;80:338-44. Nawal RR, Parande M, Sehgal R, Rao NR, Naik A. A comparative evaluation of 3 root canal filling systems. Oral Surg Oral Med Oral Pathol Oral Radiol Endod 2011;111:387-93. Duggan D, Arnold RR, Teixeira FB, Caplan DJ, Tawil P. Periapical inflammation and bacterial penetration after coronal inoculation of dog roots filled with RealSeal 1 or thermafil. J Endod 2009;35:852-7. Souza Sde F, Francci C, Bombana AC, Kenshima S, Barroso LP, D'Agostino LZ, et al. Qualitative SEM/EDS analysis of microleakage and apical gap formation of adhesive root-filling materials. J Appl Oral Sci 2012;20:329-34. Pommel L, About I, Pashley D, Camps J. Apical leakage of four endodontic sealers. J Endod 2003;29:208-10. Gorduysus M, Avcu N. Evaluation of the radiopacity of different root canal sealers. Oral Surg Oral Med Oral Pathol Oral Radiol Endod 2009;108:e135-40.